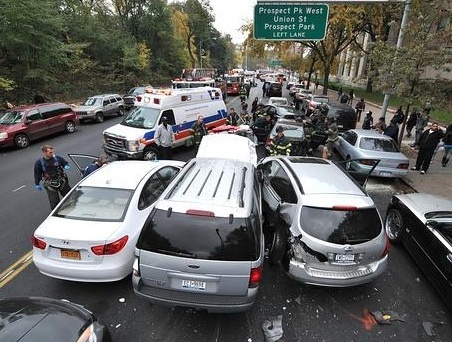 Marty Markowitz just doesn’t know how to make a point. And for a guy who has more than a little borscht in his belt, he doesn’t really know how to make a joke either. Look, I get it. It’s supposed to be a joke, a lighthearted take on a so-called controversial issue. I just don’t think it’s funny, nor do I think it effectively illustrates the point he’s trying to make. To my eye, that looks not like a nightmare that’s “getting insane,” as the lyrics inside the card say, but a hyper-idealized childrens book fantasy version of a neighborhood scene a lot of people would like to see. Disney could buy up all of Red Hook to build a Brooklyn-themed attraction and people would pay $67 a day for the privilege of walking down such a simulacra. 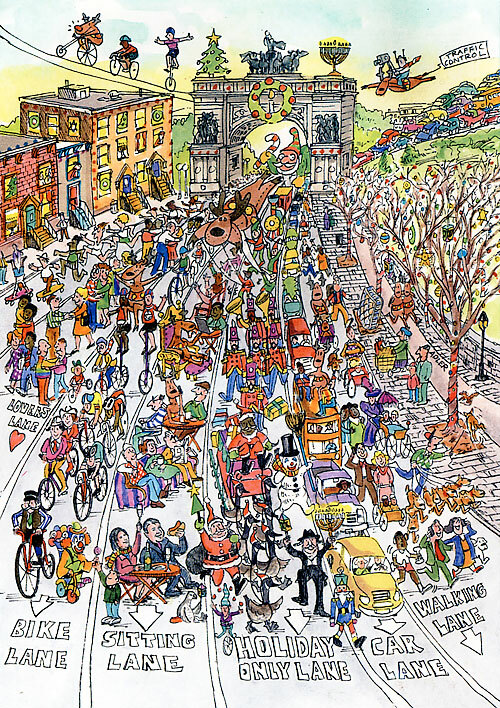 Only a real Grinch would commission an illustration of a boulevard populated by kissing couples, bicyclists, roller skaters, joggers, people enjoying drinks, parents pushing strollers, dog walkers, and a holiday parade, and think its an effective editorial, no matter how lighthearted, on the growth of bike lanes. A Prospect Park where people can sit at cafe tables and drink wine in the middle of the street? Oh, the horror! But let’s be fair. Am I and other livable streets activists–not to mention the huge number of Brooklynites who favor bike lanes–just Scrooges who can’t take a little gentle ribbing from Tiny Tim? [Transportation Alternatives] may be taking the Beep’s holiday card out of context. The colorful annual greeting is always filled with coded messages and timely commentary, the Beep’s holiday well-wishes have long been a source of media attention and fun. I’m sorry, but there’s a big difference between using last year’s card to promote pro volleyball at Coney Island, which generated no protests nor spawned any group called “Neighbors for Better Volleyball Courts,” and using an official communications device from the beep’s office to denounce something that makes cars obey the speed limit, saves lives, and has been widely endorsed by an overwhelming majority of the local community.